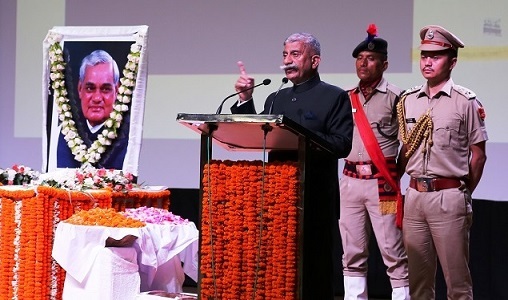 Governor of Arunachal Pradesh BD Mishra on Thursday paid rich tribute to former Indian Prime Minister Atal Bihari Vajpayee at the Dorjee Khandu State Convention Centre here. Joining the people of Arunachal Pradesh, the Governor offered prayers as the Atal Bihari Vajpayee’s Asthi Kalash, which reached Itanagar earlier in the evening and was placed with honour in the DK State Convention Centre, Itanagar. Former Prime Minister Vajpayee’s ashes will be immersed in River Lohit at Parasuram Kund, Lohit district on Friday. Remembering former PM Vajpayee for his path-breaking decisions and initiatives, the Governor said that Vajpayee was one of the most prominent personalities of the century, a great politician, an eminent statesman, able administrator, development oriented leader and a memorable poet. “He was a strong advocate of humanism. His demise is an irreparable loss to India,” Mishra said. Recalling Vajpayee’s public meeting at Begusarai, Bihar in 1967, the Governor recalled the Vajpayee’s message in which he said that for every nationalist, it is ‘Nation First’ and ‘Caste, creed, sect and religion’ come next. “Vajpayee called for strengthening and promoting leaders of developmental outlook and spirit,” the Governor said. The Governor also recalled his personal interactions with former Prime Minister, including when he requested Atal and he agreed to write the ‘Forward’ of the first book written by his daughter Kaninika Mishra. The Governor called upon the people of the State to dedicate themselves towards the peace and development of the State as a befitting tribute to the departed leader.